When I switch on channel 199 “OPTCB” on my Dstv these days I’m no longer sitting on my sofa at home in Pretoria but I instantly become a witness of the court proceedings in the trial against Oscar Pistorius. In the early hours of Valentine’s Day 2013 the world-famous South African “Blade Runner” Oscar Pistorius shot his girlfriend Reeva Steenkamp through the closed and from the inside locked bathroom door at his house in Pretoria. Pistorius claims that at the time the four deathly shots were fired he was not aware the person inside the bathroom was his girlfriend but rather thought he was facing a burglar hiding behind the locked door. Pistorius is charged with murder, the trial started on March 3rd 2014 at the Palace of Justice in Pretoria and is expected to take several weeks. Facilitated by the 24 hour availability of the trial via channel 199 and extensive other media coverage in print as well as online media, the case is receiving considerable public attention which finds expression through social media like twitter and facebook. TV Channel 199 has been created solely for the purpose of broadcasting court sessions live and uncensored which are followed by extensive expert analysis and discussions of the events. Judge Thokozile Mazipa (being the second black woman in South Africa to be appointed as a judge in the High Court) is known for her strive for a transparent judiciary but on the same time advised journalists and the public to a respectful handling of delicate information retrieved through the broadcasting of the trial. If not adhered to this requirement, Judge Mazipa stated she reserves her right to cancel live media coverage of the court proceedings. The first murder trial to be featured in a live TV broadcast in South Africa raises the questions of the weight of public interest in the case and in general the need for transparency of the judiciary system – which otherwise is sometimes being viewed as corrupt and in favour of the rich and famous South African population (see: http://mg.co.za/article/2014-03-03-celebrity-pistorius-gets-an-unfair-advantage) – versus the personal rights of the parties involved as well as further ethical considerations. For example, in the course of cross examinations of forensic and ballistic experts, pictures of the deadly injured and bloodstained Reeva Steenkamp are depicted on the screens being visible to both attendees inside the courtroom and the public watching the trial. Despite ethical considerations regarding the actual court proceedings and its contents, the way Channel 199 presents and frames the trial is especially noteworthy if not disturbing. In between the broadcasting of the trial and the following expert rounds dramatic intros are featured displaying an alive Reeva Steenkamp, the accused Oscar Pistorius, Reeva’s family but also crime scene investigations, each time ending with the display of one of the following catchy lines: Love on trial, vulnerability on trial, guns on trial, justice on trial, police on trial, forensics on trial, money on trial, friends on trial, security on trial. It seems like the universe is being on trial in this particular case. In the snapshots or short video sequences Reeva and Oscar are sometimes displayed together, smiling and leaving the image of being a happy couple. Others are depicting the amputated athlete on the racetrack wearing his prosthetics. Again others show us a contemplative Reeva Steenkamp or a short statement of her parents mourning their daughter. In addition to these pictures and videos showing people related to the trial, computer animated sequences are part of the short trailers showing for example a typical yellow crime scene tape, a gun being fired or a single red rose on a table. The colors used remain darkish, leaving the images presented tainted in blue and black. The overall particular style of display reminds me a lot of title sequences of popular crime TV shows like CSI (Crime Scene Investigation), thereby blurring the line between fictional crime cases and the Oscar Pistorius case, bringing it closer to what the public at home sitting on their sofa in the living room is used to anyway: the rhetorics and images of a suspenseful and thrilling evening entertainment. This includes the exposure to images of evidence, bloodstains, dead bodies and bullet wounds. 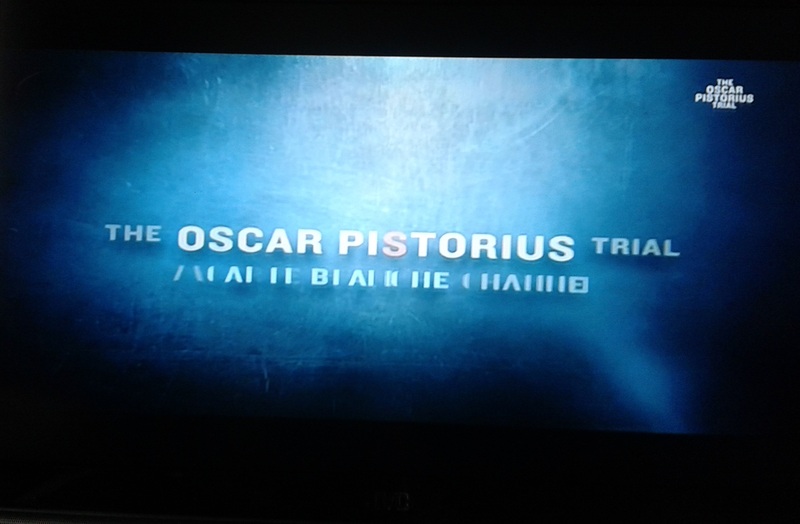 And from an entertainment perspective, the title sequence isn’t promising the viewer (who becomes a witness to the trial her/himself which increases the excitement) too much: We get to observe harsh witness examinations foremost deducted by the defense’s main attorney Barry Roux, who repeatedly tries to weaken the credibility of witnesses and experts in favour of the version that the shooting was an accident. Not drifting away from their original statements and opinions both the neighbour of Pistorius Michelle Burger and the ballistic expert Captain Chris Mangena have subsequently been celebrated by the public for their vigour and sturdiness in the face of Roux’ verbal attacks. Furthermore when pictures of the deceased were displayed on the screens, Pistorius started weeping, covering his head in his hands. At a later stage he even vomited inside the courtroom. Surly most entertaining has been Barry Roux’ claim, that neighbours who stated hearing a woman screaming that night prior to the firing of gun shots had in fact heard Oscar Pistorius screaming for help, as Pistorius, when agitated and anxious, “screams like a woman”. It came as a huge surprise when on the 13th day of the trial, prosecutor Gerrie Nel asked the court proceedings to be adjourned and to resume on Monday, the 24th of March 2014, as the State was about to conclude its case. In excitement I will have to wait for the season’s finale now, wondering if the plot might take an unexpected turn at the end. In the meantime I might start watching the second season of House of Cards.